All For Fun is proud to be California's premier party rental business with over 26 years in the industry. We Specializes in sober graduation, school dances, school carnivals, church youth groups, and other festivals and special events. 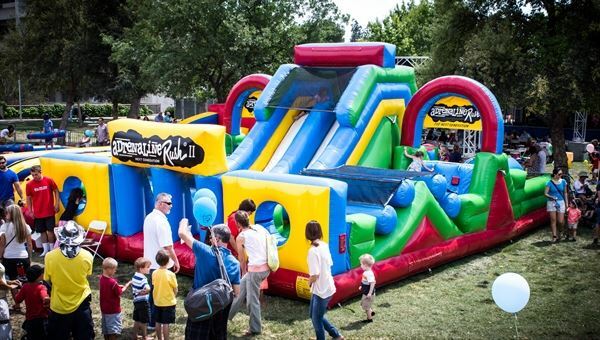 Located in the central valley we service all of California delivering such attractions as: SLIDEZILLA, 24' Mobile Rock Climbing Wall, Adrenaline Rush II, Adrenaline Rush Extreme, The Ultimate Module Challenge, 3 Lane Bungee Run and many more attractions. Our mechanical bull can be controlled for slow movement or can also buck and spin really fast. The Mechanical Bull ride head is made of Sofolex Soft Foam. This allows for the safest mechanical bull ride in the industry. Rent our mechanical bull ride for your Wedding, and see how much fun you and your guests can have. Our mechanical bull comes with two professional operator for the duration of the event. We are also fully insured, and have over 26 years of experience in this industry. We require a non returnable deposit and balance due upon arrival at event. If event is cancelled all deposits will be credited to rescheduled event. Please give us a minimum of 24 hour notice of rescheduled or cancelled event.